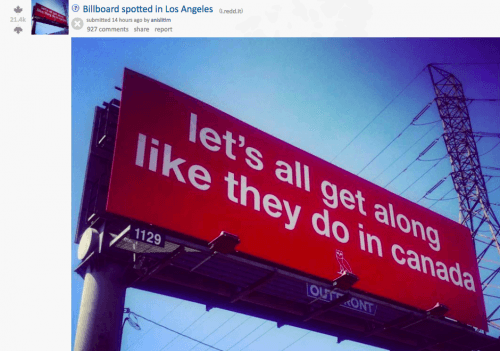 An LA billboard praising Canada for its kindness is getting quite a bit attention online. The billboard reads “let’s just all get along like they do in canada” and it was put up by none other than Canadian ambassador extraordinaire Drake, who used it to promote his OVO clothing line. The sign actually appeared last year. Drake’s manager and OVO co-founder Oliver El-Khatib Tweeted about it in 2016. News of the sign has now resurfaced and it is now the number one article on Reddit Canada, earning nearly 1000 comments in less than a day. Although we’re not totally sure why Drake’s billboard is a trending topic, we’re guessing it has something to do with the turbulent times the US is experiencing right now. Canada was recently named one of the top 10 most peaceful countries in the world, while the US fell to 114th. This isn’t the first time Drizzy has put up his eye-catching advertisements. Turns out he’s been making billboards cool again since 2014.